Club Mix – solid and steady beat with TB303 acid style rolling bassline, shouting vocal hook sample combined with the dreamy sax melody line and forward moving snare roll crescendos that keeps you moving. Ruff, groovy and elegant. Essential Mix – deep funky house vibe with a solid beat, deep and bouncy bassline, funky pick guitar, stylish synths and disco shots. The dreamy sax melody takes it to another dimension. Fantastic summer tune! Simon Sinfield Remix – UK Producer and Artist, Simon Sinfied again applies his golden touch of excellence into this beautiful, gently building track. 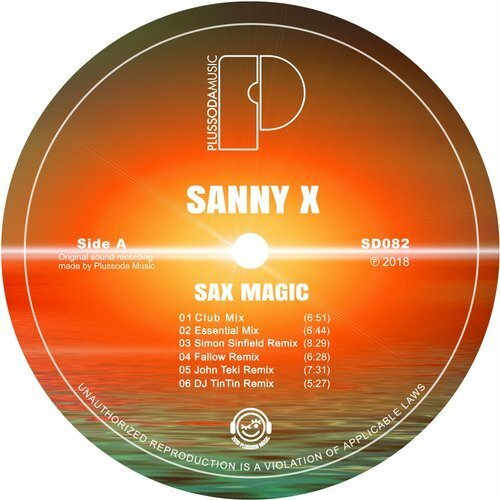 ‘Sax Magic’ steadily grows in energy and wraps its arms around the listener, ultimately to shine on global dance radio show’s and club floor’s that appreciate a more progressive and uplifting sonic journey. Fallow Remix – with a string of remixes under his belt, solo releases alongside successful collaborations, our beloved Fallow returns to Plussoda Music with yet another stylish remix. Taking the vibes into a deeper and melodic approach with a steadily evolving mood ‘n groove and the beautiful catchy sax makes it to a must have for deep house lovers. John Teki takes remix duties on ‘Sax Magic’ and rebuilds it into a strong piece of deep house with steady punchy beat, funky bassline, bossa style guitars played by Funky Spacer, dreamy vocals and the delicate sax melody takes you away – all the way to a exotic beach. DJ TinTin steps up the sunshine factor, with his NuDisco interpretation of Sax Magic. With an updated 80s style 4/4 steady beat & funky bassline, house piano riffs, MJ style finger snaps and the dreamy sax melody takes our NuDisco fans all the way to dance floor heaven!